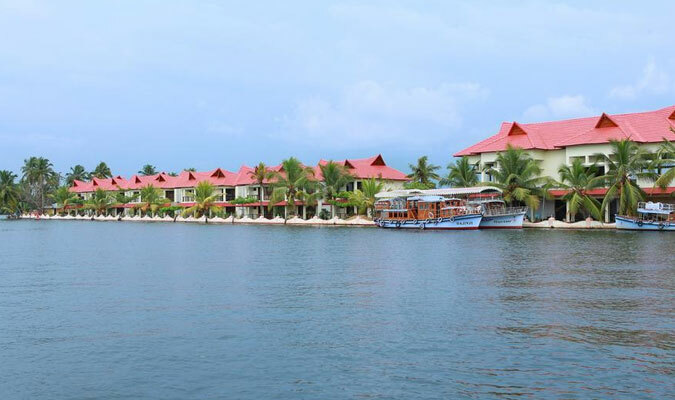 The 4-star establishment Lake Palace Hotel Alappuzha is located amidst beautiful, calm and serene surroundings. The hotel is popular among tourists because of its strategic location nearby airports and railway stations and amazing sceneries all around. The guests are lured to stay in this hotel to experience the delighting experience of house-boating in Kerala backwaters. Premium Lake View Cottages: The guests can view the beautiful Lakes with a stay in any of these luxury rooms, that are installed with all modern comforts that one can think of. Lake View Cottages: These rooms offer an utmost serene environment to breathe in while one enjoys the luxury comforts of these rooms and looks out at the gorgeous Vembanad Lake from the balcony. Water Villa: These are the most sophisticated rooms in the hotel and focus on conserving the ecosystem of Keraka. Guests may even enjoy catching fishes from the lake with a stay in these rooms. Kerala Cottage:These rooms are reminiscent of traditional golden days of Kerala.